We do! 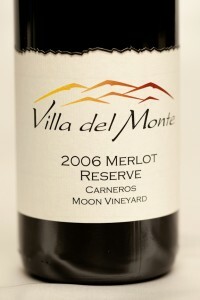 And now through May 1, we are offering a 20% discount on Villa del Monte Merlot from the Moon Vineyard in Carneros (Napa Valley). This discount applies to the 2006-2008 vintages. While there are some subtle differences from year to year, the wines, in general, are a perfect balance between red fruit, oak, and tannins. These 100% Merlots can be enjoyed now or cellared for future enjoyment. This discount is available only at the winery. We will be open most weekends through May 1. Please call 1-888-788-4583 for an appointment.